. Conventional p-n junction is called as homojunction as same semiconductor material is used on both sides junction. The electron-hole recombination occurs in relatively wide layer ≈10 µm. as the carriers are not confined to the immediate vicinity of junction, hence high current densities can not be realized.
. The carrier confinement problem can be resolved by sandwiching a thin layer (≈0.1 µm) between p-type and n-type layers. The middle layer may or may not be doped. The carrier confinement occurs due to bandgap discontinuity of the junction. Such a junction is called heterojunction and the device is called double heterostructure. i) Bit rate of 100-200 Mb/sec. 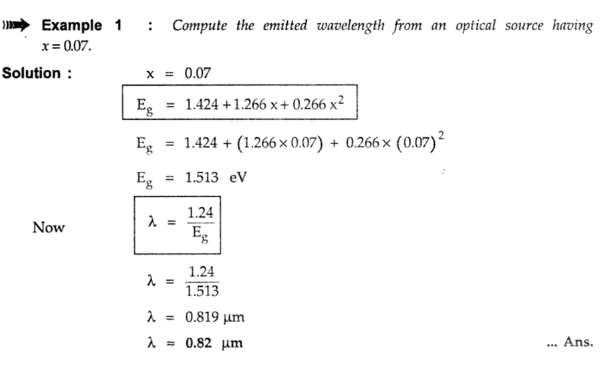 II) Optical power in tens of micro watts. LEDs are best suitable optical source.
. A heterojunction is an interface between two adjoining single crystal semiconductor with different bandgap.
. Heterojunctions are of two types, Isolator (n-n or p-p) or Antisotype (p-n). In order to achieve efficient confinement of emitted radiation double heterojunctions are used in LED structures. A heterojunction is a junction formed by dissimilar semiconductors. Double heterojunction (DH) is formed by two different semiconductors on each side of active region. Fig. 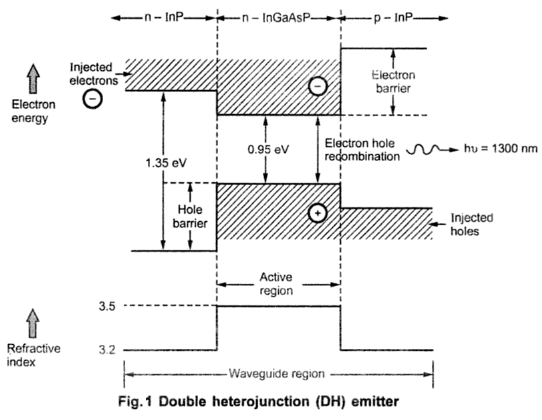 1 shows double heterojunction (DH) light emitter.
. The cross hatched regions represent the energy levels of free charge. Recombination occurs only in active InGaAsP layer. The two materials have different bandgap energies and different refractive indices. The changes in bandgap energies create potential barrier for both holes and electrons. The free charges can recombine only in narrow, well defined active layer side.
. A double heterojunction (DH) structure will confine both holes and electrons to a narrow active layer. Under forward bias, there will be a large number of carriers injected into active region where they are efficiently confined. Carrier recombination occurs in small active region so leading to an efficient device. Another advantage of DH structure is that the active region has a higher refractive index than the materials on either side, hence light emission occurs in an optical waveguide, which serves to narrow the output beam. Both devices uses a DH structure to constrain the carriers and the light to an active layer.
. In surface emitting LEDs the plane of active light emitting region is oriented perpendicularly to the axis of the fiber. A DH diode is grown on an N-type substrate at the top of the diode as shown in Fig. 2. 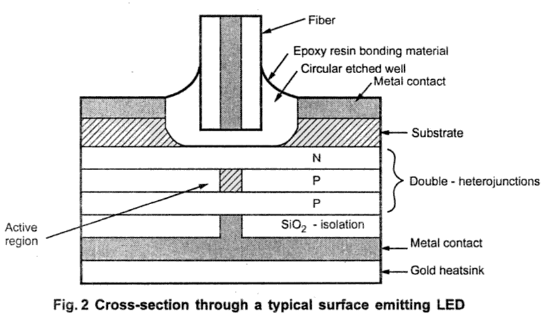 A circular well is etched through the substrate of the device. A fiber is then connected to accept the emitted light.
. At the back of the device is a gold heat sink. The current flows through the p-type material and form the small circular active region resulting in the intense beam of light. Emission pattern = Isotropic, 120° beamwidth.
. The isotropic emission pattern from surface emitting LED is of Lambartian pattern. In Lambarian pattern, the emitting surface is uniformly bright, but its projected area diminishes as cosθ ,where θ is the angle between the viewing direction and the normal to the surface as shown in Fig. 3. The beam intensity is maximum along the normal.
. The power is reduced to 50% of its peak when θ= 60°, therefore the total half-power beamwidth is 120°. 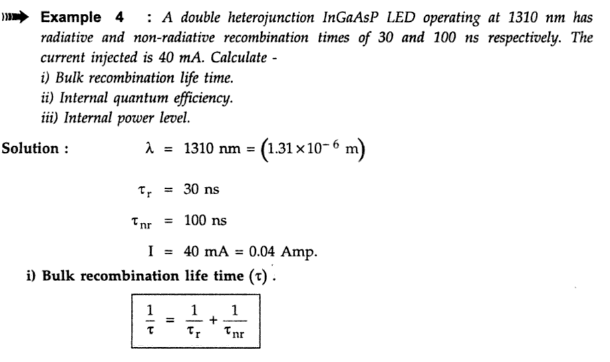 The radiation pattern decides the coupling efficiency of LED.
. In order to reduce the losses caused by absorption in the active layer and to make the beam more directional, the light is collected from the edge of the LED. Such a device is known as edge emitting LED or ELED.
. It consists of an active junction region which is the source of incoherent light and two guiding layers. The refractive index of guiding layers is lower than active region but higher than outer surrounding material. Thus a waveguide channel is form and optical radiation is directed into the fiber. Fig 4 shows structure of ELED. Edge emitter's pattern is more concentrated (directional) providing improved coupling efficiency. The beam is Lambartian in the plane parallel to the junction but diverge more slowly in the plane perpendicular to the junction. In this plane, the beam divergence is limited. 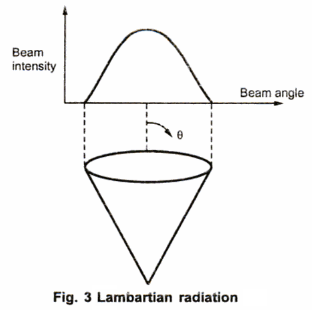 In the parallel plane, there is no beam confinement and the radiation is Lambartian. To maximize the useful output power, a reflector may be placed at the end of the diode opposite the emitting edge. 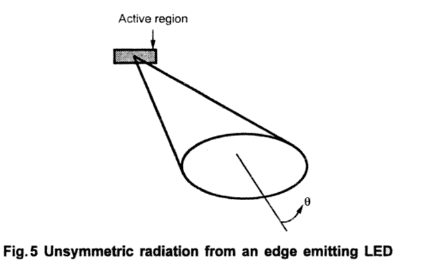 Fig.5 shows radiation from ELED. 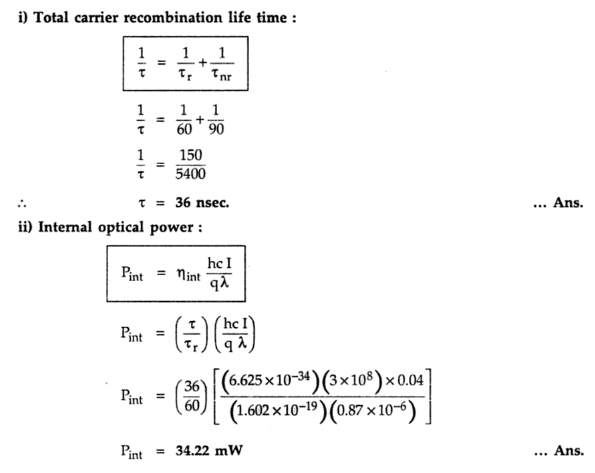 1. linear relationship between optical output and current. 2. Spectral width is 25 to 40 nm for λ= 0.8 – 0.9 µm. 3. Modulation bandwidth is much large. 4. Not affected by catastrophic gradation mechanism hence are more reliable. 5. ELEDs have better coupling efficiency than surface emitter. 6. ELEDs are less temperature sensitive. 1. LEDs are suited for short range narrow and medium bandwidth links. 2. Suitable for digital systems up to 140 Mb/sec. 3. Long distance analog links.
. 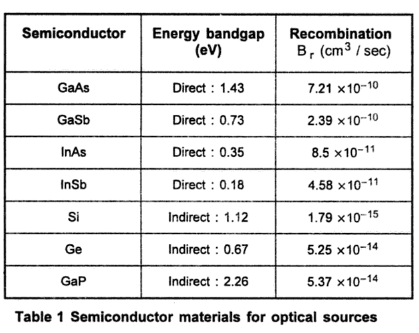 Some commonly used bandgap semiconductors are shown in following table. 1.
. Direct bandgap semiconductors the electrons and holes on either side of bandgap have same value of crystal momentum. Hence direct recombination is possible. The recombination occurs within 10-8 to 10-10 sec.
. In indirect bandgap semiconductors, the maximum and minimum energies occur at different values of crystal momentum. The recombination in these semiconductors is quite slow i.e. 10-2 to 10-3 sec.
. The active layer semiconductor material must have a direct bandgap. In direct bandgap semiconductor, electrons and holes can recombine directly without need if third particle to conserve momentum. In these materials the optical radiation is sufficiently high. These materials are compounds of group III element (Al,Ga, In) and group V element (P, As, Sb). 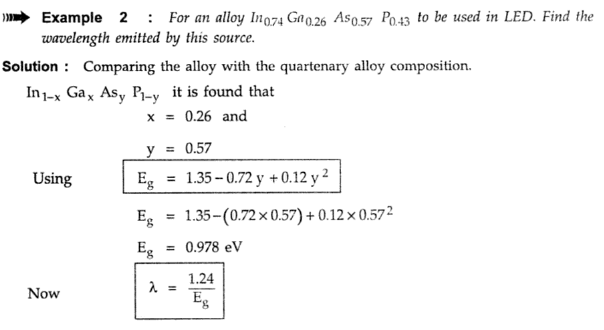 Some tertiary alloys Ga1-x Alx As are also used.
. 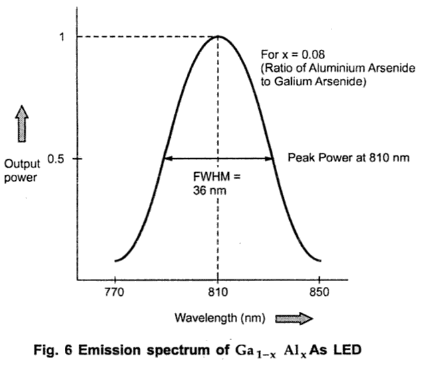 Emission spectrum of Ga1-x Alx As LED is shown in Fig. 6.
. The peak output power is obtained at 810 nm. The width emission spectrum at half power (0.5) is referred as full width half maximum (FWHM) spectral width. For the given LED FWHM is 36 nm. Where, energy (E) is in joules and wavelength (λ) is in meters. Expressing the gap energy (Eg) in electron volts and wavelength (λ) in micrometers for this application. Different materials and alloys have different bandgap energies. 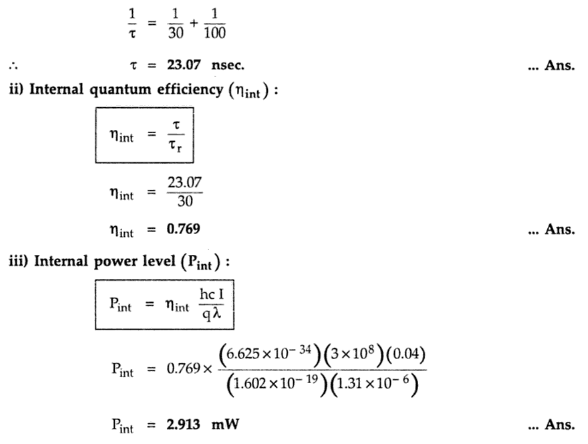 The internal Quantum Efficiency (ηint) is defined as the ratio of radiative recombination rate to the total recombination rate. Rr is radiative recombination rate. Rnr is non-radiative recombination rate. Non-radiative life time Ԏnr = n/Rnr.
. The recombination time of carriers in active region is. It is also known as bulk recombination life time. 1. Refraction of light at semiconductor / air interface. 2. The average life time of a radiative recombination is only a few nonseconds, therefore modulation BW is limited to only few hundred megahertz.